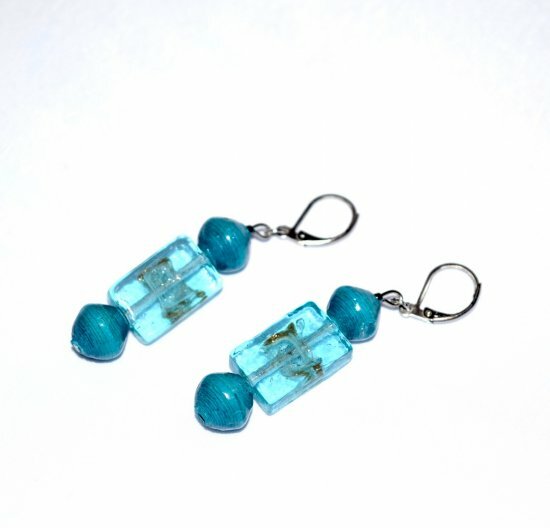 Handmade earrings with a translucent cyan glass rectangular bead with gold metallic markings accented by blue green Bead for Life rolled paper beads and a dark rainbow seed bead on hypoallergenic stainless steel lever backs. The rolled paper beads are from Bead For Life which creates sustainable opportunities for women to lift their families out of poverty. These women get first-hand experience with business concepts like accounting and quality control, by rolling paper beads and creating fashionable fair trade products. You can purchase these products onlineÂ and help transform lives. A purchase from Bead for Life helps over 12,000 people in 1,400 households each year.